There are a lot of events and pleasurable activities that us Second Lifers can participate in to have a good time. But where do we go when we really want a good laugh? After searching high and low I finally stumbled into "The Joke Jar". The outside is very welcoming with a big marquee above the entrance and a poster of the headliner off to the right as you enter. The cost to get in the club itself is a pocket stunning NO CHARGE! Once inside, you may have a seat on one of the oh so comfortable couches and wait for the show to begin. Tips are appreciated for the skillful comics, but not required. I was lucky enough to snag an interview from Rezined 'Rez' Ruby, the founder of "The Joke Jar" when she wasn't booking her next comedians. LadyLoveDr: When did you open "the Joke Jar"? Rez: The Joke Jar was officially opened to the public about 2 months ago in July. I could have opened a lot sooner, but when we were doing the walls and the contractor was going over which colors to paint what, I would tell him a color and he would yell out the window "green side up". After a few minutes of this I finally asked why he kept doing that when green wasn't my color? He informed me that he hired some blondes because they are cheaper and they were the ones installing the sod outside. We finally just went with a nice wood walkway over a stream. LadyLoveDr: Where did you get the idea for such a place in SL? Rez: A friend of mine made me laugh until I cried my eyes out. I kept telling her she needed to be a comedian. She replied "I'd love to but I am afraid of getting booed off stage". I then replied " Well, what do you think SL is for? You might as well try it out and see if it's something you would like to do or not." I built it in my shop for her to practice at. She had an actual show and turned out to be crazy funny, even funnier than the nights previously. I moved it to a different location and took on a co-owner-Jerkwad Borkotron, a very amazing friend & brother of mine that offered the land for the club, and here we are! LadyLoveDr: How far out do you book? Rez: We will book as far out as we can get. We are always needing/looking for new acts. LadyLoveDr: Do you ever ask comedians at the club’s open mic back to headline? Rez: Yes. I have also used the ones that turn in applications with us. I do ask that they give us a show beforehand. If they can't make me REALLY laugh from the get go. Then they are not for us. Unfortunately, with cancellations, this does not always happen. I can tell you that open mic has become a bit disorganized and is chaotic at times, but we have and would always use a funny person! LadyLoveDr: Have you had many hecklers? Rez: Yes, we have had a couple. I have been successful at keeping it down. We want everyone to laugh from the bottom of their guts. This doesn't mean to override the show with rudeness. Heckling is not tolerated a the Joke Jar. We ask that all keep it down to a minimum during the show. I will step in myself if it gets out of control. LadyLoveDr: What is the number one mistake a new comedian can make on stage? Rez: Be unprepared! If you're coming to do a show with us, please make sure to be there early for mic check, make sure you're ready to go a full set, and keep us laughing! 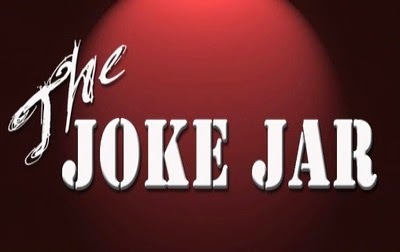 LadyLoveDr: How many employees does "The Joke Jar" currently have and how do you see that changing in the future? Rez: I have 2 owners, 2 undercover recruiters, and 4 feature comedians. We do not pay people to perform but they do get 100 % of tips they earn. Also we don't really consider them employees. Just fellow Jokesters! This interview left me eagerly waiting for the Joke Jars next show! If you're in the mood to laugh or make people laugh I'd recommend stopping by. 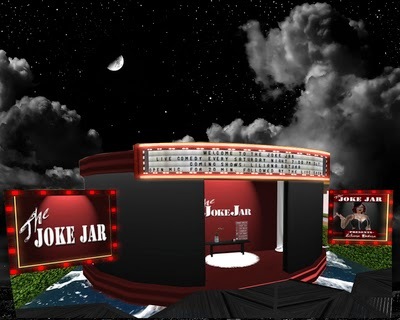 Show times are every Saturday night at 7:00 PM SLT. As far as I am concerned, I would rather spend my Saturday night laughing at the Joke Jar than trying to explain to my young blonde patient what her stick of deodorant actually means when it says "To apply, push up bottom"; and why it is necessary for her to proceed with the removal surgery!